Disturbing, indeed, if true. I wonder if Ms. Pandya was speaking candidly and on-the-record or just expressing her hopes and dreams for the project. Also will be curious to see if Corey Johnson responds. I’m half-wondering if Ms. Pandya still works (or will be working for long) at DOT. Yes, she may have decided for herself that being evasive would be even less viable than sticking her neck out, but even if she’s being quoted perfectly and expressed herself unambiguously AND that’s the way DOT is leaning, her timing could not have been worse. Ditto, the seeming “head in the sand” and arrogance conveyed to her audience. Make no mistake. There IS a political component here, and just as diBlasio won the Mayor-ality by painting himself as the best friend African-Americans and Orthodox Jews could have – he certainly has outworn his welcome with the former group – the current crop of Mayoral aspirants ARE going to “out-green” one another AND view our community as a great place to hold a fund-raiser or 5. In short, this IS now CLEARLY at least partly (largely ?) a political decision – well above the pay grade of the type of DOT employee sent to a block association Q&A. Even Polly recognizes that and has made it clear, … even if you could parse her walking things back as “mistakes were made” in rolling out the 2 plans. Sometimes, stealth works, but this is not one of those occasions. The light is blindingly bright re the BQE’s future, and the folks who’ve staked out positions ARE – in effect – the current and future bosses of everyone at DOT. I’m still not sure whether we can count on the 2 local electeds – esp. the one who lives in Cobble Hill – but we really are in “Boston Tea Party” territory, and for all that Brooklyn Heights is not the community most likely to win a citywide poll as “fave nabe,” the odiousness of running 6 lanes of traffic THERE … for THAT long strikes me as darn close to DOA. ESPECIALLY now that there are at least 2 alternatives with so much less working against them. 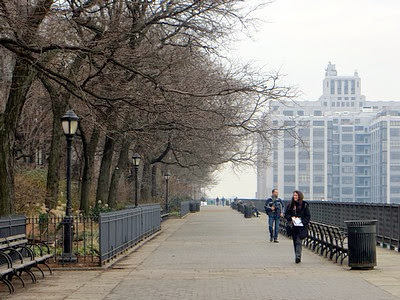 b) the Promenade DOES have a nice, varied, photogenic constituency – kids, joggers, tourists, young people in love, etc. c) the prelims re the next Mayoral contest are under way. Scott and Corey are among the most plausible contenders. They KNOW they have a club with which to beat on the increasingly unpopular incumbent, and given Bill’s hopes for a future in politics, he’s not dumb enough to stick up for the DOT at this point. “Combating global warming” is 2020’s “apple pie,” and no Democrat is unmindful of cause and effect between cars & trucks and ice melting from pole to pole! It doesn’t surprise me. From an engineering & DOT point of view the “innovative” plan is still the best approach. Unless the powers that be give the DOT a $10B budget and another decade to make it happen, Innovative or some variant will likely be the plan chosen. The biggest constraint is the 2026 moratorium on trucks (the most important users of the BQE) is rapidly approaching and there simply isn’t the time for more elaborate solutions. Unfortunately that appears to be the case. Construction will need to begin next year and I don’t think that’s possible with the BIG/BQP option which would probably require more extensive analysis, studies and planning. That’s what you get when you wait too long. But it really isn’t a DOT decision any more. diBlasio knows a loser when he sees it, and 2 of the most vocal Dems savaging the DOT approach are 2 of the most likely next Mayors! For the sake of argument, MAYBE, you’re better versed in the engineering considerations than many of us…. But you must be either less informed or less concerned when it comes to PUBLIC HEALTH. The fumes that would pervade the Heights would be nothing short of toxic. There are plenty of kids and seniors in this neighborhood; both would be very much at risk. Structural engineers probably like the idea of building a giant highway overpass — it’s old-fashioned, it’s a known quantity, it’s something they can easily wrap their heads around and know that it will likely be a (semi-)permanent fixture once it’s up. But cost-wise, several other plans have been estimated to be considerably cheaper (it’s always less costly to build on-grade rather than up high), better for the environment (fumes won’t be right on our doorsteps), quality of life, and the integrity of the Heights as a neighborhood. One thing that hasn’t gotten much attention but surely would if this plan ever went further ahead: Most of the west side of Columbia Heights would have to be condemned, or at least boarded up for the foreseeable future. I don’t see the many wealthy, influential and politically connected residents who live there taking that lying down. The health issue is completely exaggerated, the BQE is already there, generating thousands of cubic feet per minute of exhaust gases. The pollution level will be no different. If you think the fumes are now somehow blocked by the Promenade, you don’t have a grasp on basic grade school science, or your believe in magic. Think about what happens if there’s wind coming off the river, something I’ve experienced on many occasions. Currently – because I apparently understand physics better than you – it scrambles the air on the 2 traffic levels every which way…. Were the 6 lanes where the Promenade now is, it’d blow up Remsen, Montague, Clark, etc. You can’t have it both ways. The alleged clock ticking fast argues for a decision BEFORE Bill leaves office, and while litigation is the wild card, I figure the Council WILL do its job and approve something. The DOT proposal? I very much doubt it, because it will be reviled – sensibly – for a year or so of campaigning. Is the Republican candidate gonna stump for it, hoping to get the bridge & tunnel vote? I don’t have a crystal ball, but the DOT proposal looks like toast to me, badly burned toast. 2026 is a deadline suggested by NYC DOT. No one else (at least not publicly) has seen their engineering analysis (if it exists). NY State DOT actually makes the decision on when the road is unsafe. But even if one assumes 2026 is real from an engineering standpoint, it also rests on the assumption that the current volume of traffic, or the current mix of trucks and cars, need to be maintained. In reality, those assumptions are political decisions, not engineering. I don’t think that’s entirely true about Columbia Heights. DOT says they’ll just build a big wall on the eastern edge of the promenade highway, on their already-owned land (which is the current surface of the promenade). Now, I think that’s a horrible band-aid, but it doesn’t appear to require actual condemnation. Though undoubtedly you are right that every single owner will sue DOT anyway and call it “constructive condemnation.” This is another area where DOT has their head in the sand…even if they go ahead with their current preferred plan, no way construction would start in time to meet the assumed 2026 deadline (which, as I’ve said in another post in this thread, seems to me to be an artificial constraint). Fair points. I’m going by an early DOT document which I don’t have at my fingertips but said that “some” Columbia Heights properties may have to be vacated. I suspect they’re particularly referring to the buildings right on the Promenade (after all, an accident could send a vehicle flying into someone’s living room). But at the very least, their properties (and many nearby) would be plummet in value. Well put. Totally agree. BH residents simply have to bite the bullet and acquiesce. Again agree with all you said. Those who think that air is great on the promenade should go out and sit there for half an hour. The fact that the 6 lanes are hidden under the promenade now does not make the air any better. in fact it makes it all the more deceptive, and those enjoying themselves on the promenade (including the children and the elderly) don’t realize how bad the air pollution is in the area especially during traffic jams. Perhaps the the promenade should be converted into the highway permanently so people realize how bad the pollution is and stay away from the area. Thanks for the link. A great summary of all of the plans. All It takes is a little effort to educate yourself. It amazes me that in an age when so much information is instantly available, people are more ignorant than ever. Perhaps not acquiesce, but more productive strategy for the BHA et al. would be to negotiate the best deal for the neighborhood, if the innovative plan moves forward. E.g, noise abatement, pollution monitoring and compensation for those most affected. Exactly, When I was a little kid (60’s) you could see and smell the pollution on the Promenade and in the Pierrepont Playground, which would sometimes be evacuated during traffic jams. Also, the fence on the Promenade would be covered with soot from the diesel exhaust. Yes the wind is most often out of the West, blowing the exhaust fumes directly into the Heights. “Scrambles the air on the 2 traffic levels every which way” Huh? perhaps some turbulence are generated but where does it ultimately go other than over than up and over the edge of the promenade and into the neighborhood? Remember, the exhaust gasses are lighter than air and hot which make them rise. Guess you were absent that day in physics class. Yes, I’ve read the vehicle load report on that site – have you? Dozens of pages are redacted! What is this, the Mueller report?! Why on earth DOT would redact an engineering report is beyond me. …and with the additional news that the wibbly-wobbly Squibb Park bridge is going to be rebuilt, I’d say that the DOT is pretty much settled on screwing up the Promenade, since any other idea would, most likely, affect that bridge in some way. Well, they’re no less credible than the DOT when it comes to cost estimates. Bjarke Ingels Group is a respected international design firm with 400+ employees that the city itself has contacted in the past. But we can agree to disagree on the merits of the “innovative” plan. If the DOT can get past the environmental review, community opposition, and lawsuits, you still may see your plan get built someday. I don’t see any compensation coming from the city to the BH residents, that is fore sure. A good example (though not on the same scale or impact) would be when all the film trucks move in and make themselves at home in the streets usurping parking spaces and leaving garbage and yellow signs on the trees and parking poles behind. Point taken, but I don’t think film soots qualify the same level of disruption as the BQE reconstruction will. Hey it’s not “my plan” I favor the tunnel but there seems to be a lack of understanding and support for that??? And yes I would love to see the BIG/BQP get built but realize the enormous engineering difficulties and costs of that plan. I am sure you will hear back from them by 2026. Yeah, it was the same situation when I was a kid during the 80’s. It definitely wasn’t the best place for young lungs (or old). If we were in Europe or even another part of the country, we probably wouldn’t even be discussing this because a tunnel would’ve been most likely built by now. Y’think it was bad then – or now? Here’s a real expert – not at sarcasm, but at science – on the FUTURE. This isn’t somebody trying to score debating points, someone saying, “I wish they would build a $20B tunnel, but they’ll probably cheap out and spend the next 10 years making life unbearable in Brooklyn Heights.” Is that a prediction or your fondest hope, Arch?